These days, there is an abundance of butter choices from all across the globe in U.S. grocery stores, from American butter to . Professional chefs and average consumers have been turning to Irish butter brands to make flaky, flavorful pastries—but what exactly is Irish butter? How is it different than American or European butter? Why is Kerrygold so popular? Keep reading for answers on everything you need to know about Irish butter. Pure Irish butter is a variety of European butter that contains a high butterfat content and has a bright yellow hue. The butterfat content is achieved by churning fresh cream until it has reached 82% butterfat, which is common practice throughout the European Union. Pure Irish butter gets its golden yellow tones from the beta carotene-rich grass that Ireland’s cows graze on. 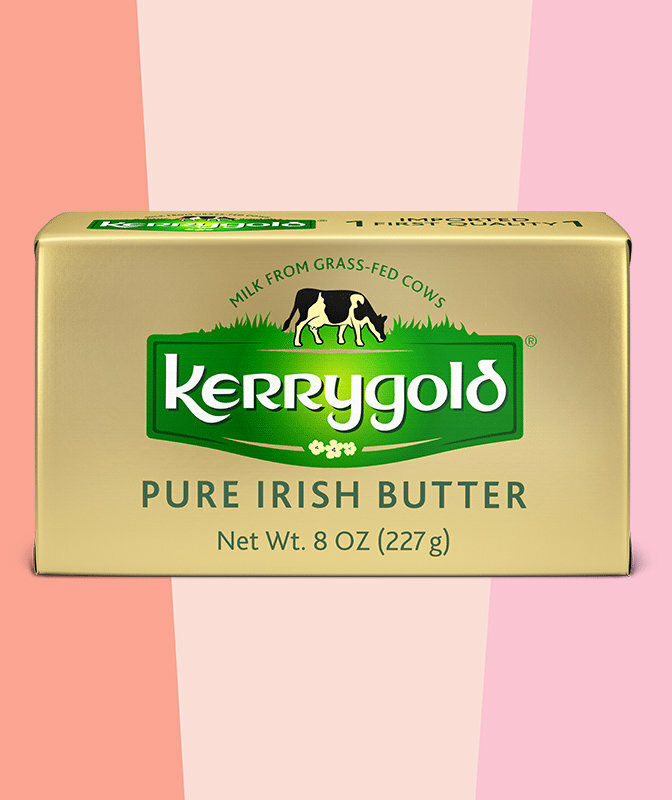 While brands like Kerrygold have popularized Irish butter in the U.S. marketplace in recent years, Ireland’s rich pasture and lush land have always had a helping hand in making the country’s butter a valuable commodity. Since the 1700s, the southwest coast of Ireland has been known for producing rich and flavorful butter. In the 1800s, it rose to even greater prominence thanks to the Cork Butter Exchange, a system of commercial butter exportation throughout Ireland and Britain. Today, Irish butter is still valued around the world by pastry chefs and home cooks alike. What’s the Difference Between American Butter and Irish Butter? American butter (i.e. Cabot, Land O’Lakes, and store brands) is predominately sweet cream butter with a higher water content than Irish butter, meaning that it is not as flavorful or spreadable as Irish butter. By comparison, most Irish butter is made from the cream of grass fed cows, which, surprisingly, creates an even sweeter butter than sweet cream American butter. The average batch of American butter contains 80% butterfat. Irish butter brands usually follow the European standard of producing butter with an 82% butterfat content, though there are variations. Beyond butterfat, there is another important distinction between American and Irish butters—the U.S. has a much stricter grading system than Ireland does when it comes to assessing butter. U.S. butter is graded from AA to B, based on flavor, color, body, taste, smell, and salt. Ireland’s evaluation system is not widely known, which once led Kerrygold, the most popular brand of Irish butter, to be banned in Wisconsin. Is Irish Butter the Same as European Butter? All Irish butter is but not all European butter is Irish butter. The climate, churning process, and breeds of cows in various regions and countries throughout Europe affects the texture, acidity, color, and flavor of individual brands. Since Ireland is a part of the EU, all of their butter is technically categorized as European butter. While we know that Irish butter producers follow the EU standard for butterfat content, there are a couple of characteristics that distinguish Irish butter from the rest. European butter is typically unsalted and cultured, whereas Irish butter is often salted and uncultured. The bright yellow hue is a hallmark of pure Irish butter. The vibrant color is so highly valued that some butter producers mimic it with artificial coloring. In butter tastings, earthy notes have also been detected in pure Irish butter, likely due to the country’s healthy landscape and grass fed cows. is a beloved brand of Irish butter that started production in 1962. Unlike most well-known commercial butter brands, Kerrygold is not sold in wholesale bulk. Therefore, home bakers and professionals alike get their Kerrygold the same way—by picking up a few 8 oz. blocks in the dairy section of their preferred grocery store. Kerrygold contains 82% butterfat, which results in an uber-creamy, flavorful product, and has that distinct yellow hue from their predominately grass-fed cows. Why Is Irish Butter Yellow? Beta carotene, which has a vibrant red-orange pigment, is abundant in many plants, flowers, and grass. The moist climate in Ireland creates fertile soil and extra-green grass, which results in higher levels of beta carotene. This adds an even brighter yellow hue in the Irish cow’s milk. Grass-fed cows absorb beta carotene through their diet and store it in their fat. While all butter is naturally yellow, Irish butter is noticeably more yellow thanks to those rolling green hills.